The Xiaomi Redmi Pro 2 doesn’t use anymore the dual camera and instead comes with a single camera. The sensor that uses at the rear camera the new model, is much better and is a 12MP Sony IMX 362. This is a 1/2.55” sensor with large 1.4µm pixels and Dual Pixel autofocus. That’s a good deal better than the 1µm pixels that the Mi Note and Mi Mix have. Other changes that we see from the image are a even larger battery of 4,500mAh from the 4,050mAh that has now. The RAM is in two versions, one with 4GB of RAM and one version with 6GB of RAM. The 6GB RAM comes with a 128GB of internal storage for the price of CNY 1,800 ($260/€245). The smaller version with the 4GB RAM comes with 64GB of internal storage and with a price of CNY 1,600 ($230/€220). 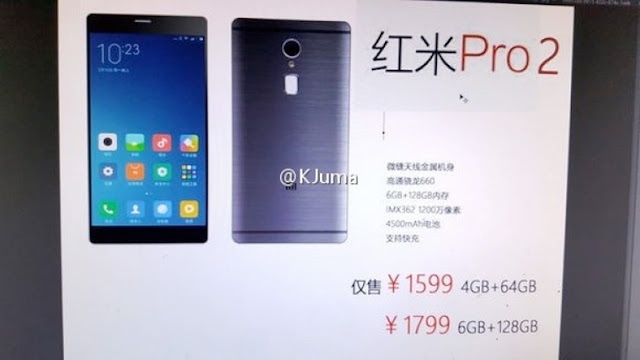 Just for the record, you can find Redmi Pro with 128GB storage and 4GB of RAM at the price of 259.99$ at Geekbuying, which is the lower price right now.